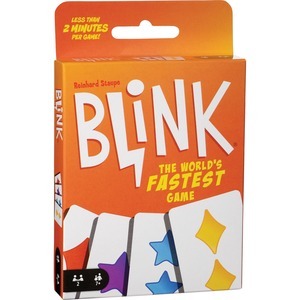 Blink is the lightning-fast game where two players race head-to-head to be the first to play all of their cards. Using sharp eyes and fast hands, players quickly try to match the shape, count or color on the cards. For instance, a card with four yellow stars could be played on any card with yellow (color), or on a card with stars (shape), or on a card with four symbols (count). The first player who can rid themselves of all their cards wins. Fast and portable, this game includes 60 symbol cards and instructions for regular and quick play. Game requires 2 players and is designed for children ages 7 and above.